How your camera works, in overly simplified terms | Stop Shooting Auto! At the very back of the camera there’s a sensor that records whatever light hits it. We don’t really care much about how this happens right now, since it doesn’t matter. For our purposes, let’s pretend that there are millions of magic camera gnomes that live on the sensor rubbing shoulders with each other and spend all their time waiting for a little bit of light to reach them. When they see light, they get excited and record exactly how much light they see. If the gnomes always got light they’d get tired and stop working, so right in front of the camera is a shutter. Think of this as a curtain that’s closed almost all of the time, but opens up for a brief moment when you want to take a picture. Whenever we take a picture there’s a lens attached to the front of the camera, and that’s where the light comes in. The lens has a lot of glass in it arranged in special ways so that everything focuses just so, but we can treat this as magic too. In addition to the glass, there’s a round opening called the aperture or diaphragm. The diaphragm controls how much light gets into the camera– open wide and a lot gets in. If it closes down to a tiny pinhole, only a little bit of light gets through to the gnomes. When you aren’t taking a picture the diaphragm is always open as far as it can be, and when you take a picture it closes down to let the right amount of light in. When you take a picture, a few things happen really quickly: the diaphragm squeezes down to block out some of the light, the shutter curtain goes up very quickly, the gnomes get all excited and write down what they see, and then the curtain closes and the gnomes go back to waiting. And that’s it in a nutshell– the magic of photography. In the next few lessons, we’ll learn how to control the aperture, the shutter, and the elves in order to take good pictures. Next lesson: The three things that go into exposure. I love reading these comments! They make me feel like I’m helping people. Oh man, you’re nuts. I came across your site when I googled histogram and its so refreshing to see someone so unpretentious explaining simple (and sometimes complex) concepts in fun and simple ways. I’m gonna learn a bunch here, I think! I love it… this is a great blog! Have you seen the McDonald’s commercial w/ the guys acting sophisticated and artsy – then they admit they are faking it and can be real w/ cheap coffee? That’s how i feel trying to teach myself photography and discovering this site! Now i just think…go gnomes go – get this one down! Thank you for pointing me towards your site, P! I’m looking forward to the education. 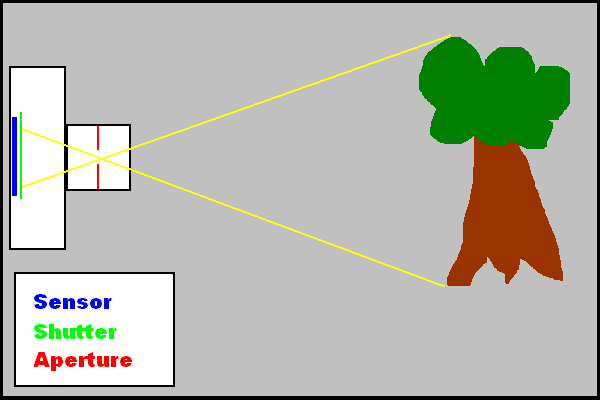 Pardon the pun but this really gives a good picture on how a camera works in an easy to read format. I like it and plan on going throught each lesson. Thanks so much. Wow, This is exactly the kind of photography blog i’ve been looking for – I get so frustrated and feel that i’m too thick to get past how it works, as a result i resort back to Auto mode (and end up feeling like a faker).. so its refreshing to see it explained in easy terms! Thank you!! You’re welcome! It’s exactly for people like you that I write this.